GREELEY, Colo. -- A Colorado waitress, who was apparently miffed that a customer didn't leave a tip, has been fired after she took to social media to vent her frustration earlier this month. Several residents posted copies of the tweet on Texas Roadhouse – Greeley’s Facebook page . One message read: "A violent and racist employee is very bad for business. Please send her packin’." That’s exactly what management did. Several residents applauded the restaurant for taking swift action. “I think Texas Roadhouse did the responsible thing in letting her go,” said Cristobal Garcia. Grantham said Texas Roadhouse did the right thing. Olson did not respond to a message seeking comment, but she did apologize via Facebook. 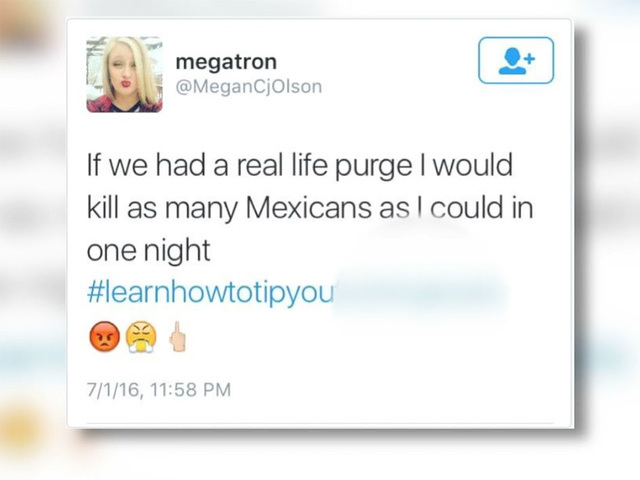 In a statement emailed to KMGH, executive director of Generation Latino, Maria Handley, said the tweet is part of the current political climate.